It’s time! Time for the annual performance review of Invest Safely’s Weekend Stock Market Outlook. 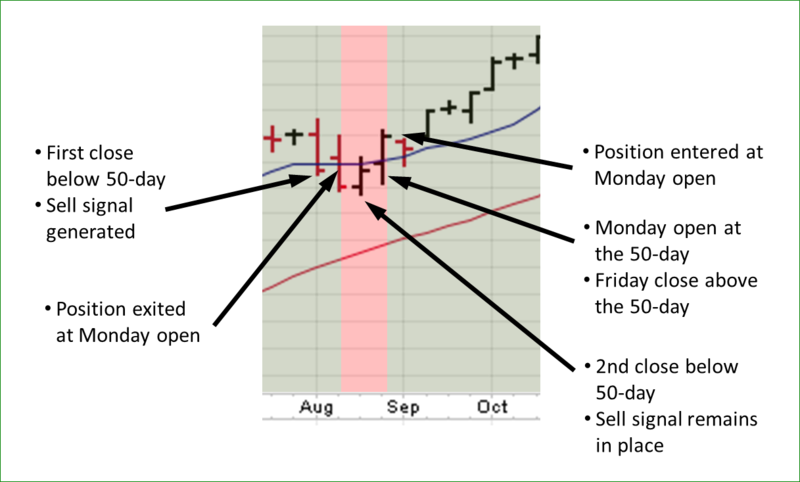 As you know, each weekend I publish an outlook for the U.S. stock markets, comparing signals from three different trading methods to determine if we’re in an uptrend or a downtrend. This is one way to monitor market conditions, which let you know when to put your money to work or take it off the table. With a little effort, the weekly outlook can be used as a simple trading system for S&P500 index funds. With a trading system, you can measure profit. At the end of each year, I go back and evaluate performance based on, you guessed it, how much money you could have made using the stock market outlook signals to trade 100 shares of S&P500 index funds. This year, I also added some metrics on the system itself, which can be used to measure risk and return. In 2015, the market outlook was a success. Using the signals protected your capital from losses and even generated some profit; returns from the general markets were flat or even negative. In 2016, the market outlook ran into some obstacles. The signals continued to protect your capital, but price changes between the signal and when I assumed an order would be executed influenced results significantly. After some analysis, I made an adjustment to my back testing, and performance improved substantially. So over the past two years, the weekend market outlook outperformed “buy and hold”. Then again, we saw some actual corrections in 2015 and 2016. Last year, we didn’t see ANY! Take a look at this chart from Advisor Perspectives. In 2017, we didn’t come close to a 5% drawdown, let alone the 10% correction level. Basically, it was risk-on all year. 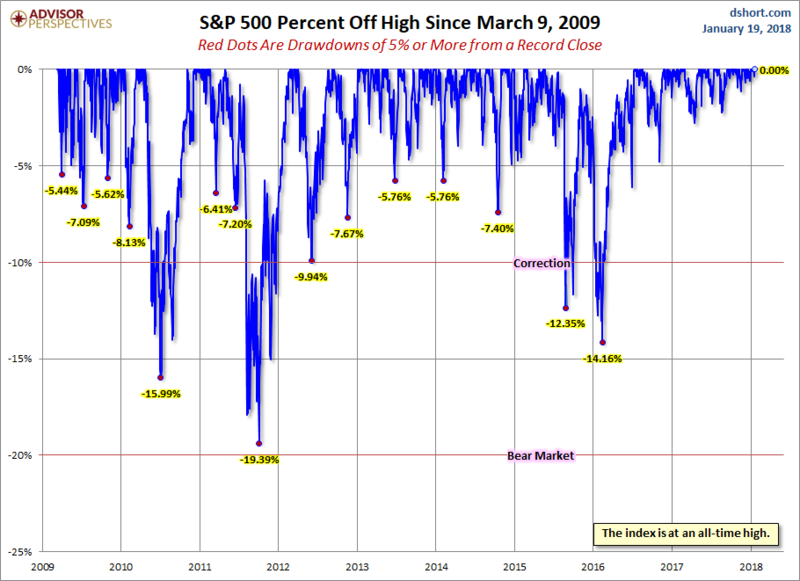 You have to go back to mid-2016 to find the last drawdown of more than 5%, and it’s been almost 2 years since we had a correction (>10% drawdown). That’s ridiculous! Since safe investing is based on aggressively protecting your capital from losses, it seems like 2017 will be another sub-par year for the stock market outlook. Performance for the stock market outlook was red across the board, underperforming a buy and hold strategy for the S&P500 by 2-3%. As mentioned, U.S. markets spent most of the year in an uptrend. Downtrends were short and shallow. 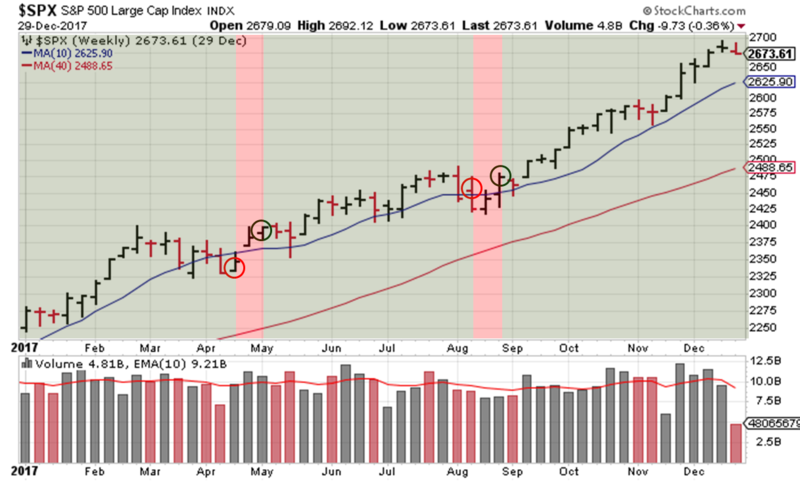 During that uptrend, money was flowing into the market almost indiscriminately and underlying issues were glossed over. You didn’t need a lot of protection. Any small drop was a buying opportunity; BTD (Buy the Dip). Nothing could stop the rally; not politics, not geopolitical conflicts, not even severe weather! A good problem to have if you’re all-in on stocks! As we discovered in 2016, this market behavior also creates issues for trading systems. Prices fall gradually, trigger a sell signal, and then find support shortly thereafter. Curiously, the stock market outlook performed slightly better for mutual funds vs. ETFs. Part of that difference comes from fees and expenses (ETFs vs mutual funds). The rest is likely based on the method each firm uses to compute a price for the S&P, rather than any input from my end. And you can see why it’s important to compare apples to apples; the stock market outlook is based on S&P signals, which didn’t translate to the Nasdaq or the Russell 2000 very well, underperforming by almost 7%. From a total return standpoint, the stock market outlook is no longer outperforming buy/hold on a cumulative return basis. Like last year, I overlaid uptrends and downtrends from the stock market outlook on the S&P500 price chart: red for downtrends and green for uptrends. Also included are the entry and exit points: green circles for entry and red circles for exits. Zooming into the March/April downtrend, we see that prices struggled at the 50-day moving average for two weeks in late March, closed below that level for another 2 weeks, and then blasted higher. 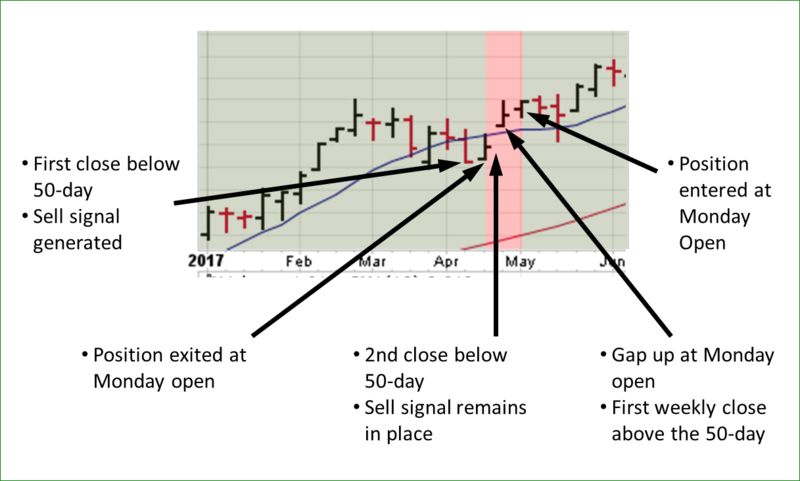 August’s price action was a bit more volatile, but a similar pattern emerged: two closes below the 50 day moving average and then recovery. False signals are a risk that goes hand in hand with mechanical trading systems. Ideally, your system will be reactive enough to protect your capital from large downtrends, but passive enough to overlook small downtrends and let your gains run. Unfortunately, every large downtrend starts off as a small one, and you’ll only know which in hindsight. There were several adjustments made for this year’s performance review. 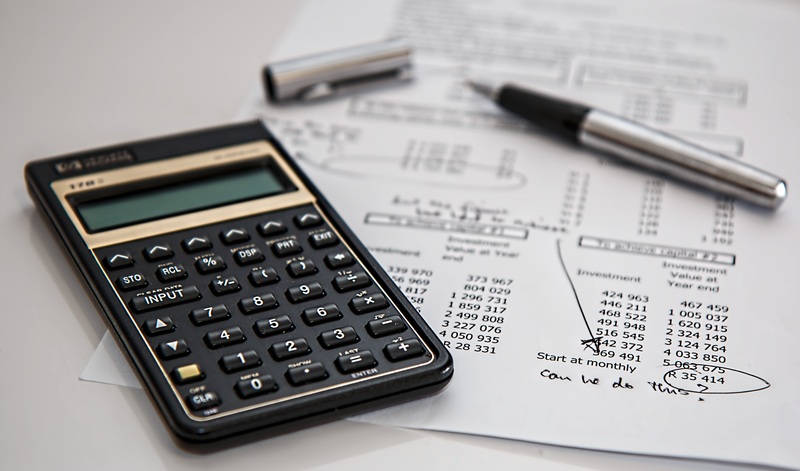 The first adjustment applied to performance measurement, and comes courtesy of the Safe Investing community. I received an email, asking why I didn’t include a Vanguard fund. I harp on lowering costs, yet didn’t include the industry standard for low cost funds. It’s a great question/suggestion. There’s no reason not to include it, so I included the performance of the signals versus two Vanguard S&P500 index options (VFINX mutual fund & VOO ETF). The second adjustment concerns costs; this time related to commissions. In February of 2017, several brokers lowered their commissions for trading stocks and ETFs. Specifically, Fidelity lowered commissions to $4.95 per trade to compete with low-cost brokers. Since I was using Fidelity as the reference for my $7.95 per trade fee, I adjusted the commissions for trades made in 2017. The third adjustment involves the stock market outlook itself: I stopped reporting “mixed” from an overall indicator standpoint. In the past, I used “mixed” to show conflicting signals. But trades only occur when the market switches to an uptrend or a downtrend. Since majority rules when it comes to uptrend or downtrend signals, I stopped calling out a “mixed” market for the overall signal; either the market was trending up or down. Overall, combining the three methods to generate buy and sell signals worked. In fact, had it been used for trading, it captured most of the profits over the past 3 years (29% out of 30.1% = 96%), while reducing the time money would be “at risk” in the market (125 weeks versus a total of 157 trading weeks from 2015-2017). So, no changes are absolutely necessary. And even though the system has underperformed buy and hold, none of the individual trades over the past three years lost money. That’s excellent. 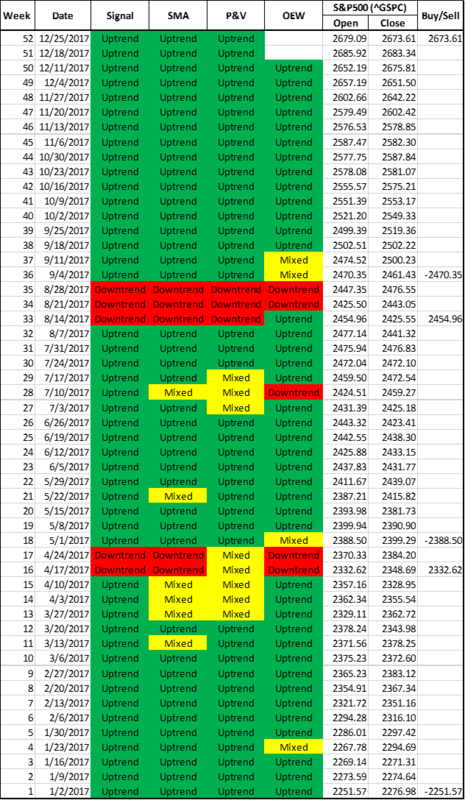 There is a potential problem with the current signals. I want three unique viewpoints, but the moving average and the price/volume overlap; both use the 50-day moving average (the 20 and/or 200 day moving averages weren’t used for signal generation). I could change the moving average timeframe to something other than 50. Or I could use a different technical analysis technique all together. Either choice requires research and back-testing. For example, using the 200-day moving average as a signal generator creates much higher returns than the 50-day, over a 10, 20 and even a 65+ year time frame. And that’s before subtracting commissions. Or, if we limit the time frame to the last 20 years, using a 50-day / 200-day moving average cross-over creates the highest return. Of course, I would also need to combine the moving average signal with the other two, to get a true measure of my “majority” rules technique. For price/volume and Objective Elliott Wave, adjusting the signals isn’t possible (rules are based on an enormous amount of historical data), so I would need to change methodologies. Basically, a non-starter at the moment. As you can see, there are several levers for you to pull (technique, timeframe, etc.). Market behavior also changes over time, so what worked 30 or 40 years ago may not be as effective today. I’ll leave it up to you to decide if changes are worthwhile for your trading strategy. For now, I’ll leave the moving average alone. Will 2018 be the year this uptrend gets derailed or will we see a repeat of 2017? Last year, the S&P500 returned 18% and didn’t have a single down month all year! I know a lot of great investors and traders who didn’t come close to that level of return…guess we should all HODL. One thing I am sure of…we’re closer to the end of this bull market than the beginning. May you be blessed with MASSIVE returns in 2018! Remember: All models are wrong, but some are useful. The objective here to improve performance. By showing you some analysis (which closely mimics the one used for all my trades), I’m giving you an example of the safe investing processes in action. I carried forward the methodology from 2016; using 3 techniques to assess the state of the S&P 500. Each weekend, I determined whether the outlook (uptrend or downtrend) has changed, based on signals from those 3 methods. By cross-referencing three different methods and only changing the overall trend for the stock market outlook when they all align, I continue to attempt to reduce the number of false signals. Since we can’t directly buy shares of an index, we need to go with the next best thing; funds. I chose two S&P funds (SPDR SPY and Fidelity FXSIX) and two Vanguard funds (VOO and VFINX) based on their availability in trading accounts. I also include funds for the NASDAQ (Powershares QQQ) and Russell 2000 (iShares IWM), to show how market signals from one index apply to other indexes. The forward looking outlook is posted on Sunday, based on stock market price action from the prior week. Since that week is already in the books, there is no way for you to “trade” at the same prices that shaped the outlook. The “price” used for calculating performance is now the market open price the week following a signal change. I’m assuming that trades are placed in an account with Fidelity, so transactions cost $4.95 per trade. Everyone should be using a low-cost broker. If a signal is generated, simulated trades are entered based on the market’s opening price on the following Monday (the day after the outlook is posted). Are you always going to get the opening price? No. Will the opening price always be the best price? No. Price slippage between your signal generation and trade execution is one of the reasons that individual results WILL vary. As an example, one astute observer pointed out that I’m using opening price across the board, yet it’s not possible to purchase mutual funds at their opening price. From an investment management perspective, I’ve used trend following for many years. I find that reviewing rules-based indicators each week helps me stay disciplined. This entry was posted in Historical Data, Investing, Market Trends and tagged investing process, safe investing, technical analysis techniques, US Stock market. Bookmark the permalink.